As many of you know, we’re big fans of Swiftkey, so after hearing the news that they have a tablet-specific version ready to rock when the Motorola XOOM is released we couldn’t help but jump for jelly beans. You can see from the shot above that it’s not your normal keyboard layout and has actually be redesigned to make typing easier using your thumbs. The normal Android keyboard on a 10″ screen is almost impossible to use, so we should all thank Swiftkey for their innovation and for thinking about the well-being of us. Video and presser after the break. MOUNTAIN VIEW, CA — A new app designed to offer a major productivity boost to typing on tablet devices, SwiftKey Tablet™, was unveiled Wednesday at Google’s global headquarters in California. The app, created by developers TouchType, has been designed in partnership with Google and Motorola to coincide with the launch of the world’s first Android™ Honeycomb tablet, the Motorola Xoom™. It makes typing on tablet devices easier and faster by offering intelligent next-word prediction that is personalized to your writing style. The app, powered by TouchType’s patent-pending Fluency Prediction Engine, employs a holographic thumb-optimized keyboard skin, designed specifically for Android Honeycomb. This marriage of elegant design with incredible back-end power gives users a novel, exciting and fast way to type on a Honeycomb tablet. Fluency™ applies patent-pending AI technology to predict around a third of words before a single character is entered. This is boosted by learning algorithms that observe how you write your email, blog, Facebook and Twitter updates, and these continually adjust as you type to become more accurate. The new Honeycomb app builds on a very successful launch of SwiftKey™, originally designed for smartphones. 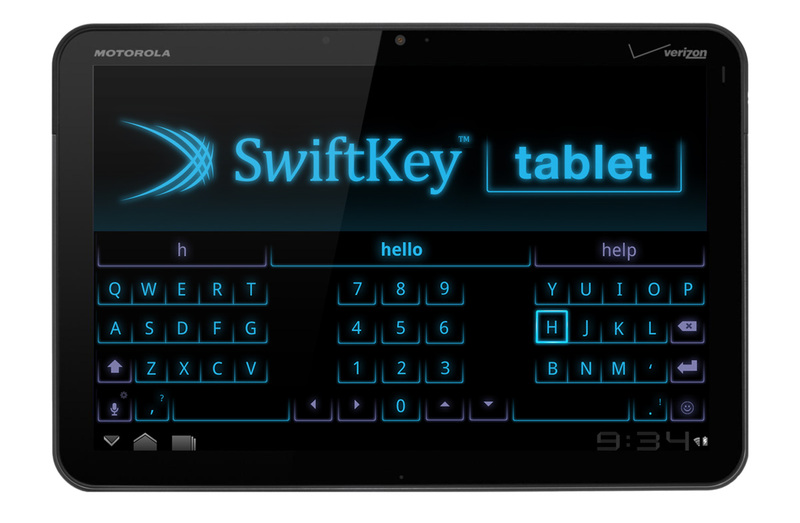 SwiftKey™ quickly became the top keyboard on the Android™ Market after launch in summer 2010, with over 700,000 downloads in its first six months, and a very positive reaction from both users and the technology press. The app is currently available for a limited sale price of $1.99 on the Android Market. SwiftKey Tablet™ will be on show at the Mobile World Congress in Barcelona, February 14-18.